Frazer tries to provide programming to tailor the functioning of the system to the laws of the state that you are operating in. These may include specific tax rates for various municipalities, state specific forms or interest and late fees limits Because of this, the functioning of the system may be different from one state to the next. 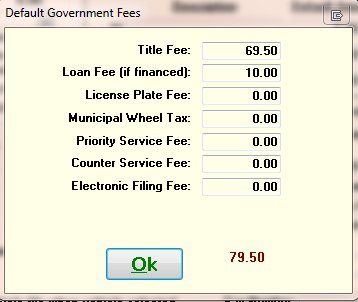 Frazer Provides a System Option to set your Default Government Fees. Check with your local agency to verify the correct amount for your area.